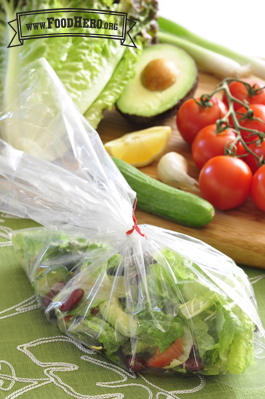 2 Comments for "Personal Salad in a Bag"
This is a really fun recipe to put together with kids. I like to have them assemble it using vegetables from each part of the plant we eat--carrot/roots, celery/stems, lettuce and spinach mix/leaves, corn or sunflower seeds, brocolli/flower and cucumbers, tomatoes or avacodo for the fruit. This way, they are not only enjoying a healthy snack, but they are excited to learn and share naming all the different parts of plants we eat. It's a recipe that could work well when the tasting is happening at a garden location or in association to garden curriculum. Tastes good! I really appreciated the variety of different vegetables in the salad!